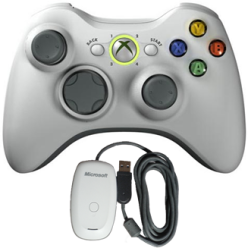 The Xbox 360 wireless controllers communicates over a proprietary 2.4 GHz protocol. In order to use a wireless Xbox 360 controller with the Titan One device you'll need a Xbox 360 Wireless Gaming Receiver for Windows. The LED on Xbox 360 Wireless Receiver should light up indicating the unit is working. This step needs to be performed only the first time. • The lights on the controller will flash and revolve to show it is searching for the Receiver. Wait until the lights stop flashing and remain on in one of the quarter sections around the Guide button. The LED on the controller should blinking, meaning the controller is tying to connect with the Titan One/Wireless Receiver. Your Xbox 360 wireless controller is connected when the display shows 0 with no dot at the bottom.